Supervised models used in the field of information extraction involve formulation of the problem as a classification problem and they generally learn a discriminative classifier given a set of positive and negative examples. Such approaches extract a set of features from the sentence which generally include context words, 3 part of speech tags, dependency path between entity, edit distance, etc. 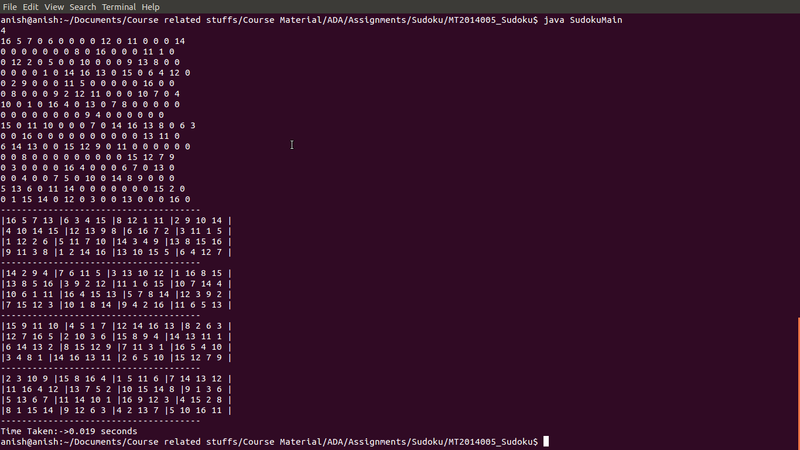 and the corresponding labels are obtained from a large labelled training corpus. 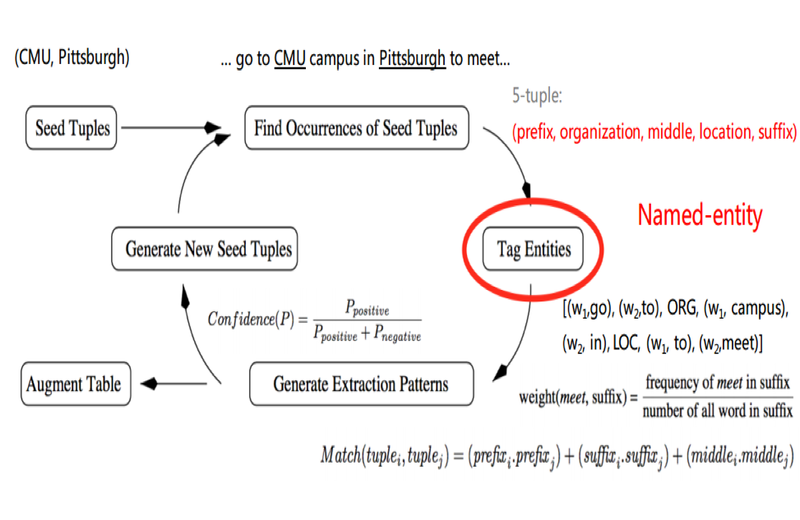 Sentence Segmentation : It will take input as a raw corpus and split it in to multiple sentences which is basically a list of strings. Tokenization : It will take list of splitted sentences and convert it in to tokens which is basically a list of list of strings. POS Tagging : It will convert in to pos tagged sentences which is basically list of list of tuples. Entity detection : it will detect entity and create chunk of sentences which is basically a list of trees. Relation detection: It will classify whether the particular relation satisfies the given entity set. Here is few more points about supervised approach and its pros and cons. It needs a set of relation types. Extension to high order Entity relation is difficult as well. 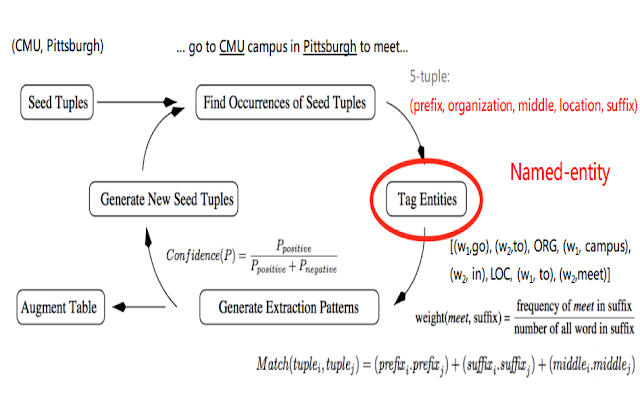 Such methods start with some known relation triples and then iterate through the text to extract patterns that match the seed triples. These patterns are used to extract more relations from the data set and the learned relations are then added to the seed examples. This method is repeated till no more relations can be learned from the data set. One more popular algorithms algorithm of it is Snowball ML algorithm. 1.) Start with seed set R of tuples. 2.) Generate set P of patterns from R . Compute support and confidence for each Pattern in P and discard those pattern with low support or confidence. 3.) Generate new Set T of tuples matching patterns P . Compute confidence of each tuple in T , add to R the tuples t in T with conf(t) > threshold. 4.) Go back to step 2. Example : (organization , product,location etc) so seed example may be (Apple,ipad,california) or (ibm,db2,Armonk ) etc. 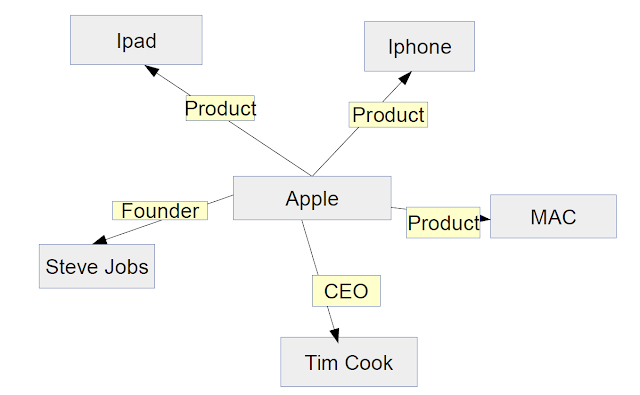 It uses a database of relations Freebase to get lots of training examples. We build a feature vector in the training phase for an ‘unrelated’ relation by randomly selecting entity pairs that do not appear in any Freebase relation and extracting features for them . 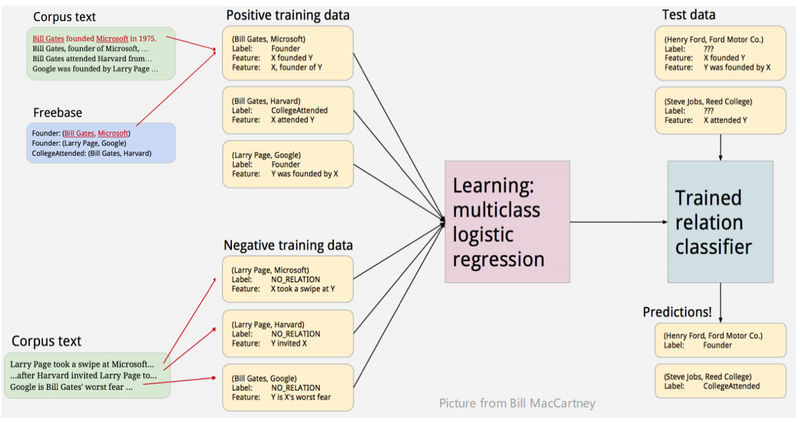 We use a multi-class logistic classifier optimized using L-BFGS with Gaussian regularization. 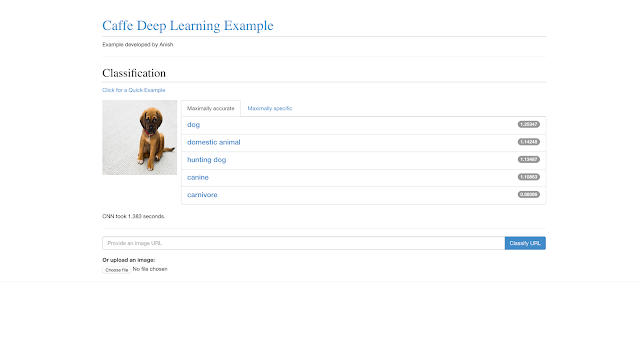 Our classifier takes as input an entity pair and a feature vector, and returns a relation name and a confidence score based on the probability of the entity pair belonging to that relation. Once all of the entity pairs discovered during testing have been classified, they can be ranked by confidence score and used to generate a list of the n most likely new relation instances.